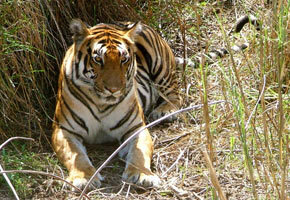 Jungle Safari – Witness the wilderness of Kanha National Park in an open gypsy/canter. Keep your eyes open for animal and bird sightings, and the beauty of the park. Nature walk – Go on a walk into the woods of Kanha, and let our naturalists give you valuable knowledge on the flora and fauna surrounding you. Bird watching – Spot some beautiful birds on this activity, and be attentive to the naturalists who give you information and details on the birdlife of Kanha.